In a storage room in a small community hospital sits a $50,000 database server that’s never been used. The system is supposed to let medical personnel access information about patient health information from workstations throughout the facility. Thus far, all it’s done is collect dust. The process of updating the network, training users, and upgrading workstations proved more costly and complex than expected at a time when hospital administrators across the nation have clamped down on spending and taken a cautious approach to adopting technology. But all that is changing as healthcare organizations try to take advantage of the financial incentives laid out in the meaningful use criteria. The work required to reach this goal is creating a high demand for qualified HIT professionals. 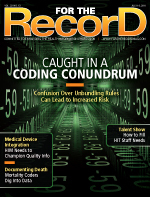 According to Encore Health Resources President and CEO Dana Sellers, recent studies have documented that the escalating demand for HIT talent has been driven primarily by the need to meet federal mandates for the meaningful use of EHRs and by the emergence of quality-based reimbursement models that will demand the use of HIT and business analytics going forward. A survey of HIT professionals conducted by HIMSS Vantage Point found that nearly three-quarters of respondents representing provider, vendor, consulting, and other related worksites indicated they had hired full-time employees (FTEs) over the course of 2010. Two-thirds said they had the budget to hire additional IT FTEs in 2011. As potential HIT candidates flood the market, how do healthcare organizations find the best people for the job? According to industry reports, the pool of HIT talent is growing and seemingly better educated. More students are looking to obtain degrees in fields such as health informatics and medical informatics. The number of students pursuing HIT, project management, and nursing informatics certifications is also growing. “The pool of HIT talent with more than five years of leadership experience with electronic medical record and computerized physician order entry expertise is still small, but it’s growing as more hospitals, medical groups, academic medical centers, and IDNs [integrated delivery networks] implement advanced clinical systems,” Siegel says. As Sellers explains, because employers will continue to actively seek out these skills in potential new hires, hospitals should consider graduates from university-based informatics programs, those who hold a master’s degree in healthcare administration programs, and experienced nurses and other clinicians with process and systems exposure. Siegel says many hospitals have IT savvy clinicians (eg, MDs, RNs, pharmacists, med-techs, radiologists, respiratory therapists), biomedical engineers, and HIM professionals who are IT superusers in their own departments. These individuals are ideal candidates to make the move to managers, directors, specialists, or even senior leadership roles in IT. Sellers suggests organizations also consider collaborating with their human resources department to develop an internal informatics career path to formalize HIT skills development, including the formation of a training program. As reimbursement strategies change, professionals with quality, finance, and medical records training are becoming increasingly important to performance improvement. These types of qualified candidates also possess skills that are needed in the HIT arena. To avoid hiring underqualified candidates, healthcare organizations should use formal job descriptions and seek out candidates with professional certifications such as CPHIMS, RHIA, and RHIT.